HP Laserjet 4 C2037A fully refurbished with Warranty. Also be sure to checkout the options you can add to your laserjet 4+, plus our service and repair options. If you have any questions feel free to Email, FAX or Call us. We also offer REPAIR service on this model of printer, if you wish to have your printer Repaired please Go Here. Proven to be one of HP's most popular printer ever. As with it's big brother the 4Si, the laserjet 4+ was made to last, great for the office or even home use. Will handle many of todays more complex printing jobs without a problem, even webpage printing. If you have a series II or III laserjet and you have been waiting on complex jobs to print, the laserjet 4+ is the perfect upgrade. 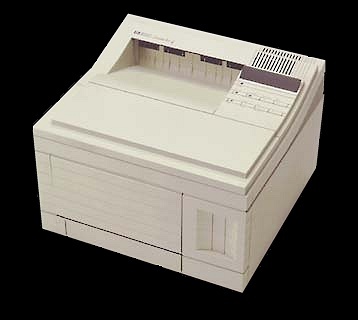 Very similar to the laserjet 4 but with improved print speed at 12 ppm vers. 8 ppm in the 4 and abiltiy to take more memory then the model 4. Comes standard with Dual Input, 250 Sheet Cassette (Letter Size) and 100 Sheet Multi-Purpose Cassette.